Sapientia, presented at Workshop West’s Canoe Theatre Festival was one of the most enlightening experiences I’ve had in a theatre as of late. An adaptation of a 10th century dramatic work by Roswitha of Gandersheim, Director and Designer Mia van Leeuwen has used the form of object theatre to cast a different light on a work that is over 1000 years old. The original piece van Leeuwen’s work is adapted from tells the story of a mother and her three daughters who are tortured by the Roman Emperor Hadrian, who wants them to renounce their Christian faith. Being firm in their beliefs, the daughters stand strong and find joy in the torture and eventually die, while their mother encourages them to become martyrs for the Christianity. 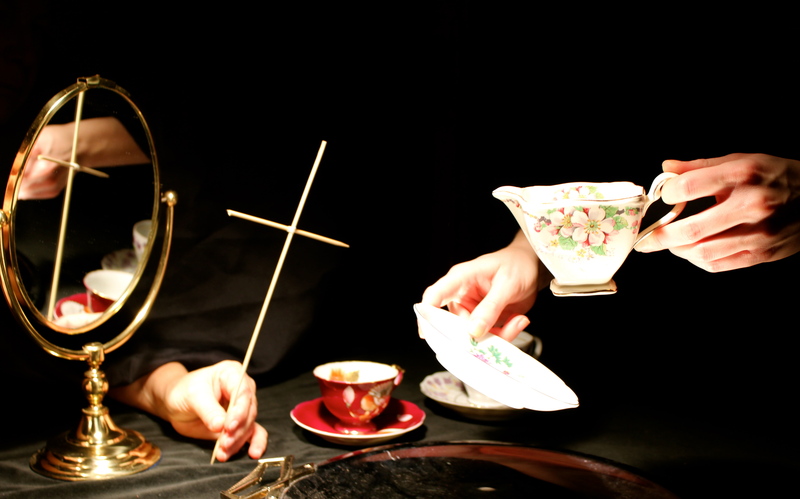 The main characters are portrayed as a kettle (the Emperor; played by David Barnet), a flashlight (the Emperor’s servant; Brendan Nearey), a mirror (Sapientia, the matriarch; Nancy McAlear), and three tea cups (the daughters Faith, Hope, and Charity; Kara Chamberlain). With the actors playing the role of puppeteer, the story is told through the objects, not the people on stage. What’s so fascinating about van Leeuwen’s adaptation is that by performing Sapientia in the style of object theatre, I questioned the preconceived notions about the play that I walked into the theatre with. Roswitha of Gandersheim, the author of the original Sapientia, lived and worked at Gandersheim Abbey as a secular canonness, which means she lived a religious life but was not a nun. Being one of her lesser-known and rarely performed pieces, I had a hard time finding information on Sapientia‘s origin, but given Roswitha’s lifestyle and the play being written in the 10th century, my assumption going into the performance was that the play’s intent was to celebrate the Christian faith. Van Leeuwen’s adaptation threw that into question for me. Using the form of object theatre made the torture scenes less painful to watch, allowing me to truly comprehend the dialogue. What emerged was a criticism of the idea of a martyr – Sapientia was hoping all three of her daughters would be tortured, killed, and pass on into heaven. Oftentimes in plays with gruesome torture scenes, the character’s (and playwright’s) intent is overshadowed by the pain we witness on stage. Using object theatre removed the suspense and some of the impact of the violence – as an audience member I wasn’t dreading the next torture scene or cringing when it happened and I was able to focus on why this was happening in the first place. As a mother, should Sapientia really have been encouraging her daughters to be tortured and die for their faith? Did the daughters truly believe in Christianity, or were they just trying to please their mother? Does faith have to be so all-encompassing that you put your faith before your children? Does the way you express your faith really have to be so public? Why can’t it be a private affair? Had Sapientia been performed in a traditional theatrical style, I think I would have empathized too much with the pain the daughters were experiencing to question the larger motives of the piece and its characters. As my first exposure to object theatre, Sapientia showed me the possibilities this performance style gives to theatre creators. Perhaps I’ve just missed object theatre performances in Edmonton in the past, but Sapientia is worth attending not just for the performance itself, but as a study of the theatrical form as well. Canoe Theatre Festival runs January 22 – February 2. Sapientia will be performed again on January 25 and 26 as part of the Canoe Theatre Festival. Tickets are $20. Check out the full festival schedule on Workshop West’s website. Was a video of this performance made? I am a student at Adams State University and am studying the works and various interpretations of Roswitha’s plays. Was a video made of this performance? I am a student at Adams State University in Colorado and am studying the plays of Roswitha and various interpretations.